For adults and children 6 and older. Clean the affected area before use. Can be cut to size. Peel off film and cover affected area with patch. For menstrual pain, place on abdomen. Keep on for up to 8 hours under normal conditions. Apply once or twice per day as needed. Allow skin to breath for a few hours between applications. Users with sensitive skin should test on a small area first. Avoid use on extremely hairy areas of the body as removal may remove hair. Sesame oil, resin, paeoniae veitchii radix, zinc oxide, drynariae rhizoma, angelica sinensis radix, carthami flos, pyritum, draconis resina, frankencense, myrrha, terebinthina, ligustiei rhizoma, achyranthis radix, acanthopanacus cortex, acori rhizoma, atractylodis rhizoma, tourmaline, saussureae radix, gentianae macrophyllae radix, cnidii monnieri fructus, cinnamonomi cortex, aconiti tuber, pinelliae tuber, dendrobii caulis, dioscoreae tokoro rhizoma, indigo carmine, tartrazine. 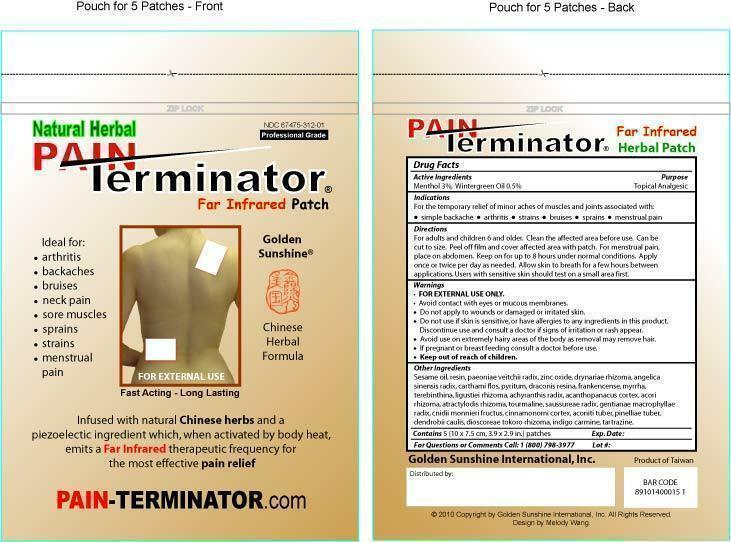 PAIN Terminator pouch for 5 patches.